November — 2011 — The War Dolls - Girls Game Too! 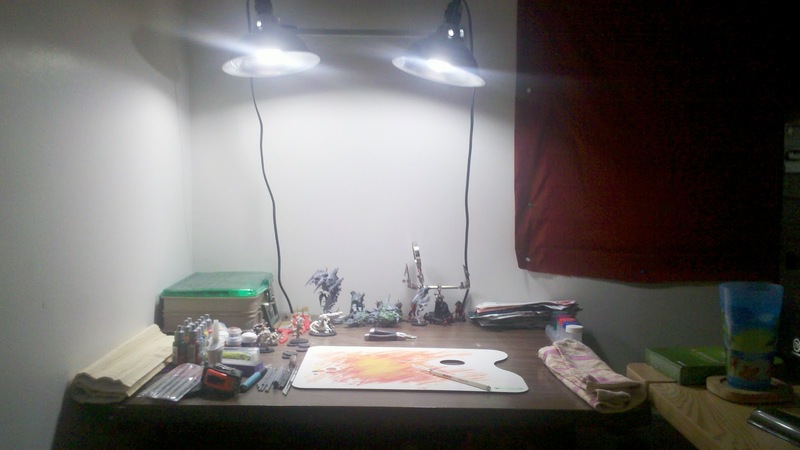 So I have finally gotten around to getting my painting workspace halfway decent to work with and paint in. My main issue in this apartment is lighting as the living room does not have its own light like I would like it to. So as you will see in the pictures below, I decided to buy some shop lights with some daylight bulbs for them to blast down up on my area. These are clamped to a towel rack which is on my wall, and it creates wonderful lighting for my painting area, I can finally see well enough to get some work done. 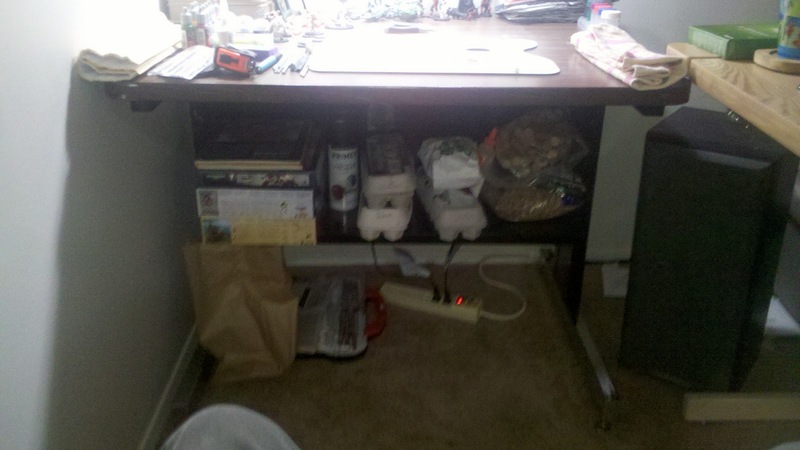 The only things I need now are a magnifying boom light, and some kind of wall mounted tool holding thingamajig. Just thought I would give everyone a Happy Thanksgiving to all my gamer friends here on War Dolls. Happy Thanksgiving everyone! Hope everyone has a wonderful, fun and safe holiday! I recently was able to visit Cool Mini or Not’s offices and got to see the piles and piles of Super Dungeon Explore that were being shipped out for the pre-orders. I had seen the game demo that’s set up in the Local Game Store here and have read through the rules and it looks like a lot of fun. Sadly I’ve not had a chance to play it, but I will post a review just as soon as I’m able. Photo note; the board is a flat two-dimensional tile setup, but they made this 3d dungeon just for the demo/store. MERCS is a small squad skirmish game based in a futuristic, mega-corporate run world. MERCS are the Corporate Security forces that are now the military might of the world. There are 9 factions that are still world powers and currently 6 of them have been released for play. Each faction is different from the rest and has pros and cons. There’s a good review of 5 of the 6 current factions here. The game itself is pretty clever and quick. Each side chooses 3 to 5 models (no point costs!) from a faction and battles are fought on a 2’x 3′ board. Models go in initiative order and can choose to Hold, Move or Combat. Movement is measured by a template that is also the stat card. Each model has a Movement Point (MP) stat that allows it to move and/or turn more than 90 degrees (the first 90 is free). There’s also a feature called ‘snap to cover’ that allows any model (even if unable to move) to jump or dive a base-length towards cover. Combat is pretty straight forward. Each model has a Firing Number (FN) that is the target to get (equal or better) for a successful shot or melee attack. Elevation, cover, facing and distance can all affect this. There are Combat Class Maneuvers and Advanced Combat Maneuvers that models can perform to increase effectiveness and strategy. CCMs are listed on stat cards and specific to certain models. Fire & Move and Load/Aim are a couple of examples of CCMs. ACMs are advanced tactics that anyone can perform. Bounding is basically one model giving another covering fire in order to gain +1 MP, Suppression is simply that, suppressive fire to make other models keep their heads down and Overwatch is waiting to take shots at those who stick their heads out of cover. I really do like this game despite the lack of vehicles (I do love my vehicles), because it makes you think. There’s no sure fire “This army wins” to it. Each faction has it’s own strengths. That the game is d10 based doesn’t hurt either, that’s my favorite die! The models are beautiful too! I was intimidated for a while that I wouldn’t be able to do them justice. Hopefully photos will follow soon. © Copyright 2019 The War Dolls – Girls Game Too!.